Just spell the word STRESSED backward...The answer is surprising, right? DESSERTS !!! Yes, do have some melt in your mouth desserts when you feel stressed. I kid you not. You will see the magic. Anyway, it's my personal theory only. 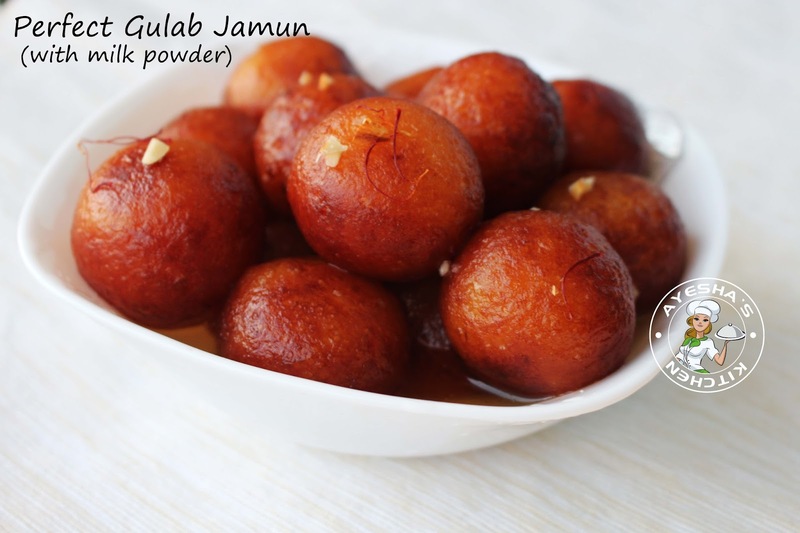 Melt in mouth gulab jamun is my favorite yummy desserts which I often make at home. A super cute and lovely dessert which suits any occasions. If you have milk powder at home, u can easily make this soft delicious sweet gulab jamun. It is preferred to buy bulk milk powder for such recipes as the use of milk powder for cooking increased these days. But here I used Nido milk powder only. Or you can use any of your favorite milk powder brands / powdered milk brands. Every country has something sweet to offer and as an Indian, i prefer Gulab jamun as my first choice among those list of my favorite Indian sweets. Shall we go for a sweet ride? ?...List of my favorite sweet recipes for every occasion is Motichoor Ladoo, Kaju katli (cashew burfi recipe), Rasgulla recipe, Jalebi, Halwa, kheer and much more. Gulab jamun / Gulaab Jamun is a milk solid based sweet mithai which is very popular in India, Pakistan, Sri Lanka, Bangladesh etc..Traditionally it is made from freshly curdled milk. This dessert is very much similar to the Arab dessert Luqmat- al- qadi, although it uses a completely different batter. This is often served at festivals like Eid, Diwali, Christmas dessert ideas and party dessert ideas for birthdays, Marriages etc. Gulab jamun gets its brownish red color because of the sugar content in milk (khoya). 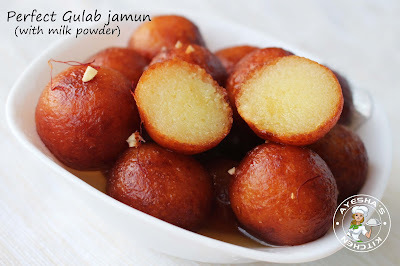 In some other variants of gulab jamun, sugar is added to the batter and when fried it will become black in color because of the sugar caramelization which is then called as Kala Jamun or black Jamun. Do try this yummy Indian sweet recipes with milk powder. So let's see how to make milk powder gulab jamun recipe / powdered milk recipes for kids / Soft and perfect gulab jamun recipe / Eggless cooking. Also please check how to make then nilavu sweet, a honey sugar candy for kids on my youtube videos. Sieve together all the dry ingredients (milk powder, baking soda, flour, and salt) to a large bowl. Combine curd and ghee well and add it to the sifted flour. Knead it well into a soft sticky dough. You must knead it very very well which makes the perfect jamun. Do not be panic if it is sticky and do not add more curd or milk for kneading (if milk is adding instead of curd, u have to add more quarter cup of milk). Just press the dough with your greased palm and knead several times. When done, set aside, covered. Let it stay for 5 - 10 minutes while you make the syrup. MAKING OF SUGAR SYRUP - Take sugar and water in a saucepan and bring it to boil. Let it boil for 8 minutes in a low flame. Here no need of reaching 1 string consistency, but must be little sticky. Now add lemon juice and cardamom powder. Mix well. The syrup must be hot while you dip the fried balls. Heat oil/ghee (for deep frying) in a non-stick pan (i prefer) or can use any. Once hot, make the flame very low. You must fry the Jamun on a low flame so that the inner will be cooked well and gives fine texture to the jamuns. Now take a small portion of the dough and make smooth balls without any cracks ( You can wet your hands while rolling with a drop of water for making softballs if required). Drop the softball to the oil one by one( i prefer dropping the balls immediately after shaping into smooth balls ). The balls must sink in the oil first and later slowly float. Now deep fry the balls over a low flame, stirring gently with a spoon occasionally. Fry until golden. Drain on a paper towel and immediately dip it in hot sugar syrup. (you can reheat the syrup if it is less hot). Let them soak for minimum 2 hours. Once cooled, keep refrigerated for few hours for the best result. 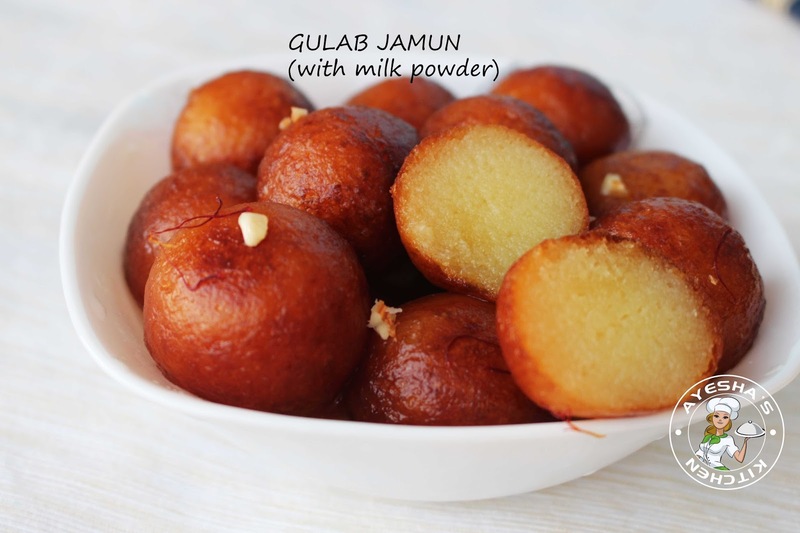 NOTE - If you are using milk instead of curd in this gulab jamun recipe, then you have to use more the amount of curd to make a smooth sticky dough. Please SUBSCRIBE to my youtube channel Ayeshas kitchen - click here for cooking videos. Thank you.